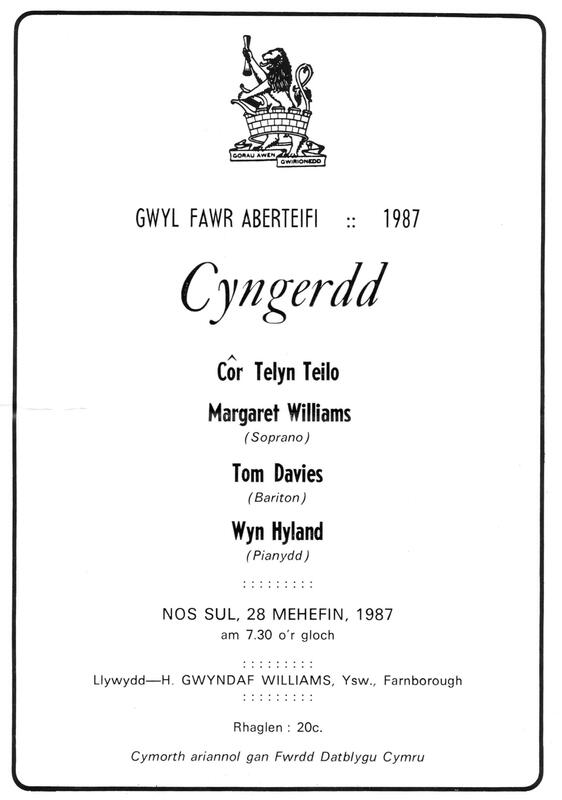 29 1880 (Tues.) Ordination of T. E. Davies, son of Daniel Davies, Pwllhai as pastor of churches in Cwmaman and Cross Inn, Carmarthenshire. 28 1900 (Thurs.) First Open air concert at Victoria Gardens. 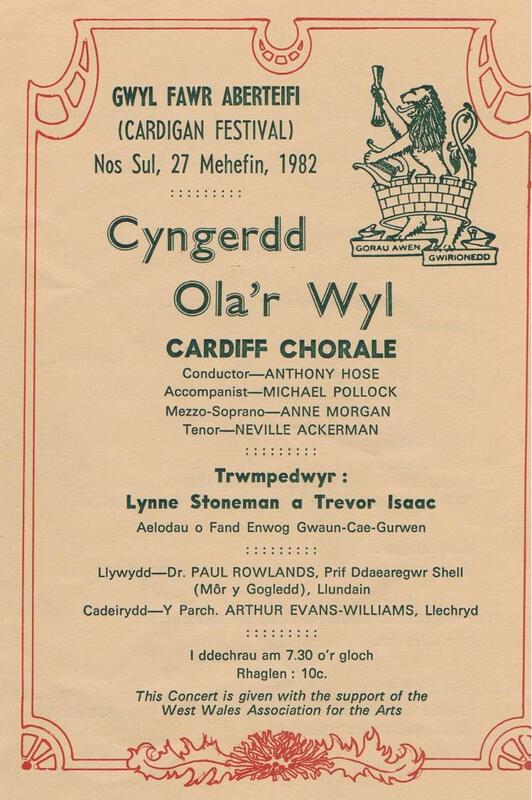 27 1982 (Sun) Gwyl Fawr Aberteifi: Last Concert of the Festival: Cardiff Chorale; conductor Anthony Hose; trumpeters: Lynne Stoneman and Trevor Isaac. 27 1871 (Tues.) Public holiday in Cardigan on the marriage of David Griffith Davies of Pantygrwndy and Miss Arabella Berrington. 26 1922 (Mon.) Burial of Edward Claude Jeffs, Imperial Club, Church St, 6 weeks old, son of Wyndham. “The inhabitants of Cardigan were greatly alarmed on Friday evening by Rebecca and her daughters paying a visit to the Pensarnau Turnpike Gate, on the Aberystwyth Road, and the Rhydyfuwch gate on the Llangoedmor Road. “At about 11 o’clock in the evening, a large party were seen coming down Cardigan Common preceded by about six horsemen, exceedingly well mounted, the rest on foot. The horses were in full gallop, and those on foot running after them at a rapid pace. They were all disfigured, having their faces blackened, and wearing some women’s clothes, and otherwise disguised, carrying with them guns, swords, scythes, pitchforks, and other weapons of destruction, intended no doubt as self defence in the event of being attacked. Immediately on their arrival at the Pensarnau Gate, the work of demolition began and the saws and hatchets were distinctly heard, and whilst the work of destruction was being carried on, several shots were fired, followed by tremendous shouting. “The gate and hedge soon disappeared, but the toll-house, being strongly built – the roof and walls were of the best materials as to stone and mortar – it appeared that it was difficult for them to destroy it. They the left and came down through the centre of the town to the cross, then turned down St Mary St., over Pontycleifion to Rhydyfuwch gate, which with walls there unto attached being old, immediately vanished. “We are told that one of the leaders went to the tollhouse, kept by a widow who remonstrated with her and expressed the hope that none of her furniture would be damaged, when Becca replied: “Be not alarmed, we want only gate and walls, shut your door upon you. Your house and furniture will not be touched”. After finishing the work the horsemen galloped away and the rest dispersed”. The riots continued and in July, the Cardigan gates were destroyed once again. 22 1897 (Tues.) Victoria Gardens officially opened by Evelyn Morgan-Richardson. Rifles Volunteer Band, leader Colour Sgt Tom Lewis, played and entertained the public at the stand. 600 children entertained to tea at the Corn Market by the Mayor and Mayoress W J Williams, solicitor.